Schools opened in New York in 1818, in Pennsylvania in 1820, Kentucky in 1823, Ohio in 1827, Virginia in 1838, and Indiana in 1843. Within forty years of the opening of the Hartford school, twenty had been established altogether, and, by the turn of the century, more than fifty. In larger cities, deaf students could attend local private and religious schools, many of them founded by deaf people, but the majority attended the residential schools. The residential school was the crucible in which American Deaf culture was forged. Students came to these schools from scattered farms and small towns. They slept in common dormitory rooms, ate at common tables, attended classes, learned about the world, and came of age together. The residential schools, like boarding schools everywhere, created a fairly regimented life for the students. Residential schools were complete communities in themselves, and life within them reinforced the cohesiveness of the developing Deaf community. Students passed their days immersed in a language addressed to the eye and among people, hearing and deaf, who valued it. They formed deep and long-lasting attachments to their schools, their teachers, their classmates, and, most of all, to a way of life they created together and shared. When students came of age and graduated, some remained to work as dormitory, kitchen, or maintenance staff. The brightest among them stayed on to take “high classes” and often became teachers themselves. 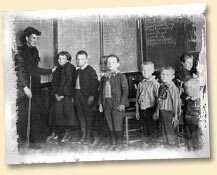 By the 1860s, deaf teachers made up nearly 40 percent of the total. Thousands of young deaf people came to these schools to spend years living and studying together. More than a new language was formed; from the countless daily interactions and negotiations of life in a small, intimate community, a new culture emerged. Deepened and enriched by each passing generation, American Deaf culture over time generated the creative outpouring typical of human communities everywhere—folklore, poetry, storytelling, and oratory; as well as games, jokes, naming customs, rituals of romance, and rules of etiquette and proper conduct—all enacted in a language suited to a visual people. Deaf students, like hearing students in the expanding public school system, spent most of their instructional time in reading, writing, and arithmetic, but as they advanced they also studied geography, science, art, history, and trades. Bible study and chapel attendance were usually required, though religious concepts suffused the entire curriculum.